Rail devolution in the South East: time for everyone to speak up! Stories have been circulating for a few days that the devolution of Metro South Eastern rail services to Transport for London, and the associated benefits for longer-distance commuters may be torpedoed by the Department for Transport in coming weeks. Today’s announcement by the Secretary of State is silent on this. Instead it’s about some reorganisation within the rail industry, So it doesn’t address the issues of better services for customers, more focus on supporting economic growth in the region, stronger management of train operators, and greater local accountability that his own Department promised in January. It’s time for members and others to make their voice heard again. Otherwise the opportunity will be lost for a further cycle and we’ll be stuck with another franchise on the current, failing, model. The Mayor of London, Sadiq Khan has commissioned London TravelWatch to carry out an independent review of the closure of ticket offices on London Underground, and its impact on passengers. For the review London Travelwatch are undertaking a number of activities including surveys and focus groups amongst passengers and staff, and mystery shopping of journeys on London Underground. If you can help, please complete the public survey on http://www.londontravelwatch.org.uk/ticketofficereview by Monday 24 October 2016. 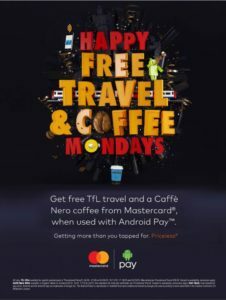 A total of £122 worth of free travel on the TfL system is available over four Mondays in October for passengers who use Android Pay and Mastercard on the Oyster/contactless system. Because we’re still waiting for Oyster to be extended to Sevenoaks, Dunton Green, and the Darenth Valley line stations it won’t cover journeys here – just as we have missed out on previous similar offers. However a parallel offer gives one free hot drink at Caffè Nero in Sevenoaks High Street on the same days. 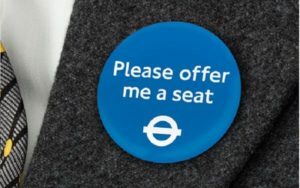 Transport for London are trialling a “Please offer me a seat” badge, similar to their “Baby on Board” system. The idea is to encourage other passengers to give up their seat to those less able to stand. Southeastern and Thameslink have existing systems of Priority Seating Cards open to anyone who is elderly (“over 65”), pregnant, travelling with children under three, or has a disability. 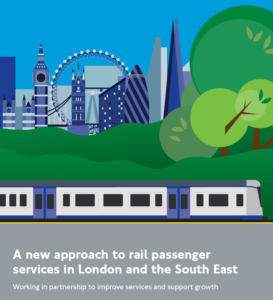 Have Southeastern and Thameslink given up?